Use these shoulder-specific high-intensity techniques to build 3-D delts. If there is one muscle group that can truly set you apart from the rest of the iron-pumping crowd, it is most definitely the shoulders. Why do I say that? Well, because the deltoids “live” in three-dimensions, with heads in the front, side, and back. Any curious onlooker can clearly see just how developed your shoulders are no matter where they are standing. In addition, big, thick, and wide shoulders are not only easily noticeable when in a T-shirt, but also when wearing a dress shirt, sweater, and even a fitted suit. In other words, no other muscle screams, “I lift hard and heavy!” like the shoulders do when they’re fully developed. Of course, wanting big delts and manifesting them are two entirely differently things. If you have been trying hard but are still finding yourself with only gumballs at the ends of your clavicles when it’s cannonballs you’re after, here is some advice that may remedy the situation. Train shoulders on their own day: Many lifters try to fit in delts with other large muscle groups, such as chest or back. This is a mistake when looking to maximize the size and density of the shoulders. Train shoulders more than once per week: As a coach to bodybuilders and athletes for over 25 years, I have found that when it comes to stubborn muscle groups, quite often they need more frequent stimulation than areas that grow more easily. However, I feel the best approach is to do one full workout and one mini-workout (a few days later) for the weak area. So for example, if on Monday you train delts by themselves with 12 to14 work sets, you can then hit them again on Thursday, along with another bodypart, but with only half the volume (six to seven sets). Control the negative: One of the best ways to stimulate hypertrophy is by slowing down the eccentric contraction on each repetition. This is not only important on presses, but laterals and upright rows as well. Cycle “shock” techniques into your workouts: When dealing with a lagging body part, you must on occasionally push it further than normal or provide for it a unique type of stimulus. If you have been reading my work over the last 15 years, in magazines and on the internet, you may be aware of my P/RR/S training system. This is a training protocol I developed, specifically designed to allow for continuous progress without plateaus. It’s a three-week rotating, cyclical system that incorporates very different training methods (each week) to tap into all the body’s growth mechanisms. The “S” stands for “shock,” and it is during these weeks that I throw convention out the window and attack the muscle in ways that literally force it to respond by getting larger and stronger. *Rest-Pause: With this intensity technique, you will choose a weight that will allow you to reach momentary muscular failure in the prescribed rep range (10 to 12 in this case). At that point you will take a 15-second rest and again go to failure with the same weight. Finally, you will take a 30-second rest and then push for as many reps as you can. That is one complete rest-pause set. **One-And-A-Half Reps: This unique way of performing your reps will most certainly shock the muscle! Begin by pressing to the top, then lower slowly to the bottom and follow with a half press. Lower the weight yet again and then push to the top. That is a single one-and-a-half rep.
***Partial Reps: This technique is great for filling the delts with lactic acid, which produces a powerful growth-stimulating burn. Once you have reached momentary muscular failure (with a complete range of motion), you will then continue performing partial reps until the point you can barely move the weight even an inch. 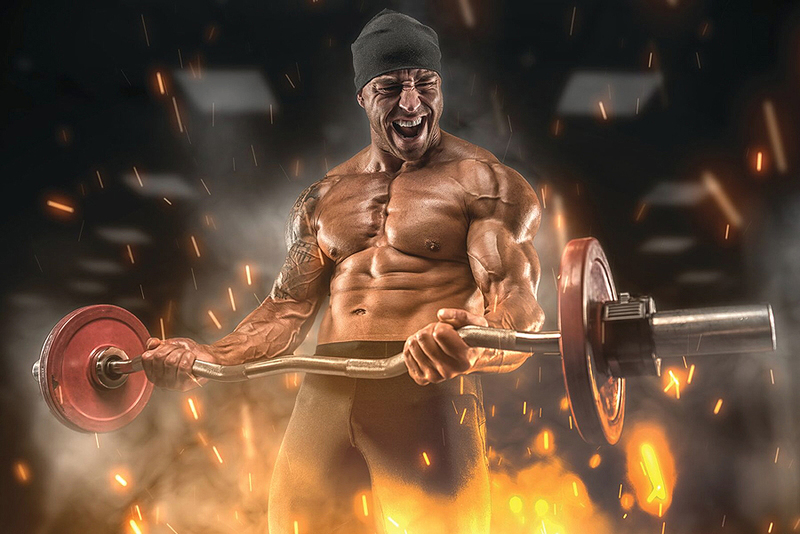 ****Drop Sets: This classic intensity technique has been around for decades but is still one of the best ways to ignite hypertrophy in a lagging muscle group. Choose a weight that has you reach momentary muscular failure in the prescribed rep range (seven to nine reps in this case). Once you can no longer do a full-range repetition in strict form, immediately drop the weight by about 20 to 30 percent and once again go to failure.